Remembered as one of the most noted and influential musicians of Classico–Romantic Europe, ‘the first of the great virtuosos’ (Harold C Schonberg, 1963), Muzio Clementi, born in Rome, spent the greater part of his life in England, working variously as composer, pianist, teacher (his pupils including Czerny, Field and Meyerbeer), publisher (of Beethoven among others), and piano maker. He is buried in Westminster Abbey. ‘Clementi’, wrote Edward Dannreuther over a century ago, ‘may be regarded as the originator of the proper treatment of the modern pianoforte … He is the first completely equipped writer of sonatas. Even as early as his Op 2 [published in 1779] the form sketched by Scarlatti and amplified by C P E Bach is completely systematized, and it has not changed in any essential point since. 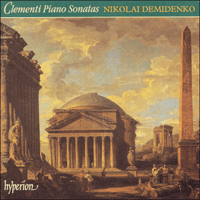 Clementi’, Dannreuther continues, ‘represents the sonata proper from beginning to end. He played and imitated Scarlatti’s harpsichord sonatas in his youth, he knew Haydn’s and Mozart’s in his manhood, and he was aware of Beethoven’s in his old age; yet he preserved his artistic physiognomy—the physiognomy not of a man of genius, but of a man of the rarest talents—from first to last.’ Enjoying a long life, spanning successive generations from Handel and Gluck to Berlioz and Liszt, he was valued highly by Beethoven and admired in particular by Brahms (for whom, according to Clara Schumann’s Diary, 11 November 1861, he ranked notably ‘on account of his great, free form’). His often remarkable influence on the early sonatas of Beethoven has been usefully examined by Harold Truscott (Arnold and Fortune, The Beethoven Companion, 1971). Clementi visited Vienna in December 1781, playing the B flat Sonata from Op 24 before an audience that included Joseph II and Mozart. He ‘plays well, so far as execution with the right hand goes’, Mozart reported to his father (12 January 1782). ‘His greatest strength lies in his passages in thirds. Apart from this, he has not a pennyworth of taste or feeling—in short he is simply a mechanicus.’ (Clementi was more generous to his famous rival, publicly acknowledging his ‘singing touch and exquisite taste’.) Comprising a terse sonata Allegro (launched by an idea Mozart was to recollect/steal years later for his Magic Flute Overture), an expressive slow movement in the dominant, and a brilliantly ‘running’ Rondo finale, the B flat Sonata was first published by Storace of Howland Street, Rathbone Place, London, as part of a ‘Collection of Original Harpsichord Music’ (entered Stationers’ Hall, 23 July 1788). The F sharp minor Sonata—usually identified as Op 26 No 2 but in fact published originally by Dale of London as the fifth of ‘Six Sonatas for the Piano Forte; dedicated to Mrs Meyrick … Opera 25’ (entered Stationers’ Hall, 8 June 1790)—is an example of what Shedlock in 1895 defined as that class of Clementi work where ‘his heart and soul were engaged’ to the full. The tenor of its first movement is a mixture of dolce expression, capricious fingerwork, off-beat sforzando accents, teasing articulation (the slurs and dots tell in an orchestral way), and tonal surprise (not least the polarity of the exposition which closes in the dominant minor, C sharp, rather than the expected relative major, A, of Classical routine). The reprise—expanded and developmental—is irregular: alternately bleak and brilliant in figuration and character, what it does in particular with the opening idea (imitatively, registrally, harmonically) is wittily provocative. The middle slow movement is in B minor, a poignantly felt song, potently textured and voiced, dramatic in its contrasts of soft and loud, of minorial pathos and sweet maggiore release, of dark diminished-seventh tension, of poetically meaningful ornamentation. Structurally its shape is elegant and balanced, combining breadth of phrasing with economy of expression. The 3/8 Presto finale is an imaginatively inventive cameo of Scarlattian brilliance and Mendelssohnian fleetness, of glittering thirds and equally elfin and stormy octaves. Historically, such music is Classical. Temperamentally, it is Romantic. The three turn-of-the-century Op 40 Sonatas were issued in 1802 in London (entered Stationers’ Hall, 11 September), Paris (October) and Vienna (November). As Harold Truscott has shown (to the point of comparative illustration) the Allegro con fuoco of the B minor, No 2, and the Adagio molto of the D major, No 3, have much in common with the first two movements of Beethoven’s D major Sonata, Op 10 No 3 (published four years earlier). Coincidence? Plagiarism? Who now was influencing whom? Or was it simply that both composers were men of their time, speaking the same lingua musica? We cannot be sure. The links though are certainly uncanny. Not quite a sonata quasi una fantasia, but with plenty of fantasy in its bones, the B minor is an extraordinary affair. Prefaced by a slow introduction (track 10)—a tempestuous mix of Classical rigour, Hungarian fire and a moment of bass shift that might almost be out of Beethoven’s yet-to-be-printed Op 31 No 2 (fourteen bars before the end of the exposition)—the first movement is large-scaled, with the exposition (repeated) closing in the dominant minor (cf Op 25 No 5), followed by a lengthy development that contrasts exposed, icy two-part legato canonic writing (very Clementian, cf the minore of the companion D major Sonata’s finale) with brilliant staccato attack, crisp thirds/sixths and bravura broken octaves. The second movement, combining the functions of alternating adagio and finale, is a curious structure: A1 (Largo)—B1 (Allegro)—A2 (Molto adagio)—B2 (Presto). A1 is a sonata design, with the start of the development section alluding back cyclically to the pair of right-hand diminished sevenths a fourth apart which round off the slow introduction of the first movement. The recapitulation omits the first subject which is brought back instead in A2, a ferocious, speeded-up coda of virtuoso figuration and punched-out cadence. The bleak, sparse, recitative-like slow sections variously remember C P E Bach and beckon late Beethoven. Announced by a portentous double-dotted introduction in the minor, the D major, Op 40 No 3, is more conventional, a sonata in the brillante style which looks equally to Mozart and Beethoven. Its most immediately Beethovenian coincidence (‘Waldstein’ link-passages apart) is the lyrical first subject of the first movement, an idea whose combination of tonic pedal-note drone and flattened-seventh subdominant colour brings to mind at once the opening of Beethoven’s ‘Pastorale’ Sonata, Op 28 (in the same key), published in Vienna the previous month—a work whose subsequent first-movement developmental climax on F sharp (viewed as the dominant of the submediant, B) is likewise shared. The most Mozartian aspect is the dolce element of the same Allegro’s second subject group, a theme whose quality of child-like innocence can also remind one of Schubert (the Rondo of the D major Sonata, D850, for instance). Initially, the C natural inflexion of the first subject is harmonic. Latterly, in the polyphony of the development section, it becomes tonal—an interesting example of organic long-term association. Leading straight into the finale (a bright sonata-rondo with a tricky canonic minore), the D minor slow movement, a yearning tapestry of rich gran espressione feeling, supported by wondrous harmonic sonority, embellishment and voicing, concentrates the attention differently. ‘For the Piano Forte’, says the first edition—rightly. Here indeed is music born out of an instrument already modern. Présent dans les mémoires comme étant l’un des musiciens les plus remarqués et les plus influents de l’Europe classico–romantique, «le premier des grands virtuoses» (Harold C Schonberg, 1963), Muzio Clementi, né à Rome, passa la majeure partie de sa vie en Angleterre. Il est enterré à Westminster Abbey. «Clementi», écrivit Edward Dannreuther voilà plus d’un siècle, «peut être considéré comme l’initiateur du traitement du pianoforte moderne à sa juste valeur … C’est le premier écrivain de sonates complètement équipé. Même dès son op. 2 [publié 1779], la forme esquissée par Scarlatti puis amplifiée par C P E Bach est complètement systématisée, et elle n’a changé en aucun point essentiel depuis. Clementi», déclare Dannreuther, «représente la sonate en son nom propre du début à la fin. Il joua et suivit l’exemple des sonates pour clavecin de Scarlatti dans sa jeunesse, il connaissait celles de Haydn et de Mozart à l’âge adulte, et n’ignorait pas celles de Beethoven à un âge plus avancé; cependant, il préserva sa physionomie artistique—la physionomie non pas d’un homme de génie, mais d’un homme aux talents les plus rares—depuis le début jusqu’à la fin.» Profitant d’une longue vie couvrant des générations successives, de Hændel et Gluck à Berlioz et Liszt, il était tenu en haute estime par Beethoven, et admiré en particulier par Brahms. Son influence souvent remarquable sur les premières sonates de Beethoven a été utilement examinée par Harold Truscott (Arnold and Fortune, The Beethoven Companion, 1971). Clementi visita Vienne en décembre 1781, où il joua la Sonate en si bémol, extraite de l’op. 24, devant un public qui comprenait Joseph II et Mozart. Il «joue bien, pour ce qui est de l’exécution à la main droite», rapporta Mozart à son père (12 janvier 1782). «Sa plus grande force réside dans ses passages en tierces. Cela mis à part, il n’a pas un sou de goût ou de sentiment—en bref, il est simplement un mechanicus.» (Clementi était plus généreux pour son célèbre rival, reconnaissant publiquement son «ton chantant et son goût exquis».) Composée d’une sonate en trois mouvements Allegro (lancée par une idée que Mozart allait reprendre/dérober quelques années plus tard pour l’Ouverture de sa Flûte enchantée), d’un mouvement lent expressif dans la dominante, ainsi que d’un Rondo finale brillamment «courant», la Sonate en si bémol fut publiée en premier lieu par Storace à Howland Street, Rathbone Place, à Londres, dans le cadre d’une «Collection de musique pour clavecin originale» (inscrite au Stationers’ Hall le 23 juillet 1788). La Sonate en fa dièse mineur—habituellement identifiée sous le titre d’op. 26 no 2, mais en fait publiée à l’origine par Dale de Londres comme étant la cinquième de «Six Sonates pour Piano Forte; dédiées à Mrs Meyrick … Opéra 25» (inscrite au Stationers’ Hall le 8 juin 1790)—constitue un exemple de ce que Shedlock définissait en 1895 comme cette classe du travail de Clementi dans laquelle «son cœur et son âme étaient impliqués» pleinement. Le ténor de son premier mouvement forme un mélange d’expression dolce, de travail des doigts capricieux, d’accents sforzando sur les temps faibles, d’articulation railleuse (les liaisons et les points le font sentir d’une manière orchestrale), et la surprise tonale (notamment la polarité de l’exposition qui s’achève dans la dominante mineure, do dièse, plutôt que dans la majeure relative à laquelle on s’attend, la, ou la routine classique). La reprise (prolongée et à caractère développant) est irrégulière: tour à tour morne et brillante dans la figuration et le caractère, ce qu’elle entreprend, en particulier avec l’idée d’ouverture (au niveau de l’imitation, du registre, de l’harmonie), est sciemment provocateur. Le lent mouvement du milieu, en si mineur, est un chant ressenti d’une façon poignante, à la texture et à la voix puissantes, spectaculaire par ses contrastes de doux et fort, de pathétique mineur et de relâchement maggiore charmant, de sombre tension en septième diminuée, d’ornementation poétiquement significative. Structurellement, sa forme se présente de façon élégante et équilibrée, associant l’ampleur du phrasé à l’économie d’expression. Imaginatif par son invention, le finale Presto en 3/8 constitue un camée de brillance dans le style de Scarlatti, et de rapidité dans celui de Mendelssohn. Au point de vue historique, une telle musique correspond à l’époque classique. Au point de vue du tempérament, elle se situe dans l’ère romantique. Les trois Sonates op. 40 composées au tournant du siècle furent publiées en 1802 à Londres (inscrites au Stationers’ Hall le 11 septembre), à Paris (octobre) et à Vienne (novembre). Comme l’a démontré Truscott (au point de l’illustration comparative), l’Allegro con fuoco du si mineur, no 2, et l’Adagio molto du ré majeur, no 3, ont beaucoup en commun avec les deux premiers mouvements de la Sonate en ré majeur, op. 10 no 3 de Beethoven (publiée quatre ans auparavant). Coïncidence, plagiat? Qui donc influençait qui? Ou était-ce simplement parce que les deux compositeurs étaient des hommes de leur temps, parlant la même lingua musica? Rien ne peut nous l’assurer. Les liens, cependant, sont certainement mystérieux. Pas tout à fait une sonata quasi una fantasia, mais avec beaucoup de fantaisie dans sa constitution, la Sonate en si mineur constitue une affaire extraordinaire. Préfacé par une introduction lente, le premier mouvement est à grande échelle, par l’exposition (répétée) qui se termine dans la dominante mineure (cf op. 25 no 5), suivie par un développement prolongé, qui contraste l’écriture legato en forme de canon en deux parties à la brillante attaque staccato, aux tierces cassantes et aux octaves de bravoure rompues. Le second mouvement, qui allie les fonctions d’adagio et de finale alternants, est de curieuse structure: A1 (Largo)—B1 (Allegro)—A2 (Molto adagio)—B2 (Presto). A1 est une forme sonate, le début de la section de développement faisant à nouveau allusion de façon cyclique à la paire de septièmes diminuées de la main droite, séparées par une quarte, qui arrondissent la lente introduction du premier mouvement. La récapitulation omet le premier sujet qui, à la place, est ramené en A2, une coda féroce et accélérée de figuration virtuose et de cadence frappée. Annoncée par une introduction prodigieuse à double point en mineure, la Sonate en ré majeur, op. 40 no 3, est plus conventionnelle, par son style brillante qui ressemble de façon égale à Mozart et à Beethoven. Sa coïncidence la plus immédiatement beethovénienne se trouve dans le premier sujet lyrique du premier mouvement, une idée dont l’association du bourdon de la fondamentale tonique à la couleur de la septième bémolisée de sous-dominante rappelle aussitôt à l’esprit le début de la Sonate «Pastorale», op. 28 (dans la même tonalité), de Beethoven, publiée à Vienne le mois précédent; sa coïncidence la plus mozartienne réside dans l’élément dolce du second groupe de sujet du même Allegro, thème dont la qualité d’innocence enfantine peut aussi évoquer Schubert (le rondo de la Sonate en ré majeur, D850, par exemple). Au début, l’inflexion naturelle du do, dans le premier sujet, est harmonique. Vers la fin, dans la polyphonie de la section de développement, elle devient tonale—exemple intéressant d’une association organique à long terme. Menant directement au finale (une sonate-rondo vive au minore astucieux, en forme de canon), le lent mouvement en ré mineur, tapisserie vive au sentiment gran espressione riche, soutenue par une sonorité harmonique, un ornement et une harmonisation prodigieux, concentre l’attention d’une manière différente. «Pour Piano Forte», mentionne la première édition, ce qui est bien à propos, car voici de la musique née d’un instrument déjà moderne. Der in Rom geborene Muzio Clementi gilt als einer der wichtigsten und einflußreichsten Musiker der europäischen Klassik–Romantik—laut Harold C Schonberg (1963) war er der „erste der großen Virtuosen“. Vor über hundert Jahren schrieb Edward Dannreuther: „Clementi darf als Urheber der richtigen Behandlung des modernen Klaviers angesehen werden … Er ist der erste Sonatenkomponist, der dazu das angemessene Rüstzeug besitzt. Schon in seinem frühen op. 2 [1779 erschienen] hat er die von Scarlatti angedeutete und von C P E Bach verstärkte Form vollkommen systematisiert, und sie ist seitdem nicht mehr wesentlich verändert worden. Clementi ist die Sonate schlechthin—in seiner Jugend spielte und ahmte er Scarlattis Cembalosonaten nach, als Erwachsener kannte er Haydns und Mozarts Sonaten und im Alter waren ihm Beethovens Sonaten nicht fremd. Und doch behielt er durchweg seine eigene künstlerische Physiognomie bei—die Erscheinung nicht nur eines Genies, sondern auch eines Menschen mit einem sehr raren Talent.“ Seine oft bemerkenswerte Bedeutung für die frühen Beethoven-Sonaten wurde eingehend von Harold Truscott (Arnold and Fortune, The Beethoven Companion, 1971) untersucht. Im Dezember 1781 reiste Clementi nach Wien, wo er in einem Konzert, dem auch Kaiser Josef II. und Mozart beiwohnten, die Sonate in B aus op. 24 spielte. Später (12. Januar 1782) berichtete Mozart seinem Vater: „Er spielt gut, was die Ausführung der rechten Hand anbetrifft. Seine größte Stärke liegt in seinen Terz-Passagen. Abgesehen davon besitzt er jedoch kein Quentchen an Geschmack oder Gefühl—kurz gesagt, er ist nichts als ein Mechanikus“. (Clementi war da seinem berühmten Rivalen gegenüber schon großzügiger und lobte öffentlich sein „singendes Spiel und auserlesenes Feingefühl“.) Die Sonate in B mit ihrem prägnanten Allegro (das aus einer Idee entstand, die Mozart später für die Ouvertüre seiner Zauberflöte übernahm/plünderte) erschien ursprünglich im Londoner Musikverlag Storace, Howland Street, Rathbone Place, als Teil einer „Collection of Original Harpsichord Music“ (eingetragen in der Stationers’ Hall am 23. Juli 1788). Die Sonate in fis-Moll, die gewöhnlich als op. 26 Nr. 2 bezeichnet wird, vom Londoner Verleger Dale ursprünglich jedoch als die fünfte von „Sechs Sonaten für das Pianoforte, Mrs Meyrick gewidmet … Opera 25“ (Eintragung in Stationers’ Hall vom 8. Juni 1790) veröffentlicht wurde—gilt als Beispiel für die von Shedlock 1895 definierten Werke Clementis, „bei denen er mit Herz und Seele ganz dabei war“. Die Qualität des ersten Satzes ist eine Mischung aus dolce Ausdrucksweise, kapriziöser Fingersätze, synkopierten sforzando Akzenten, spöttelnder Artikulation (aus der orchestralen Art der Schleifer und Punktierung erkenntlich) und tonaler Überraschungseffekte (nicht zuletzt die Polarität der Exposition, die im Gegensatz zur klassischen, verwandten Durtonart, A, unerwartet mit der dominanten Molltonart, Cis, abschließt). Die weitläufige, durchführungsartige Reprise ist unregelmäßig, Figuration und Charakter sind abwechselnd trostlos und brillant. Besonders die Behandlung des Einleitungsthemas (nachahmend, harmonisch, „registerartig“) ist gekonnt provokativ. Der mittlere langsame Satz in h-Moll ist ein prägnant gefühlvolles Lied, stark strukturiert und spartiert, mit dramatischen Kontrasten aus leise und laut, mollartig weichem Pathos und süßer maggiore Befreiung, mit dunkler Spannung der verminderten Septime, mit poetisch bedeutungsvoller Ornamentation. Die Struktur des Stückes ist elegant und ausgeglichen, optimale Kombination von breiter Phrasierung und sparsamer Ausdrucksweise. Das 3/8 Presto Finale ist genial, voller Einfallsreichtum, eine Kamee Scarlattischer Brillanz und Mendelssohnschen Tempos. In historischer Hinsicht ist diese Musik der Klassik zuzuordnen. Dem Temperament nach ist sie aber eindeutig romantisch. Die um die Jahrhundertwende entstandenen drei Sonaten des op. 40 erschienen 1802 in London (Eintragung in Stationers’ Hall vom 11. September), Paris (Oktober) und Wien (November). Wie Truscott bewiesen hat (durch vergleichende Darstellung), besitzen das Allegro con fuoco der h-Moll-Sonate Nr. 2 und das Adagio molto der D-Dur-Sonate Nr. 3 viele Gemeinsamkeiten mit den ersten beiden Sätzen von Beethovens Sonate in D-Dur, op. 10 Nr. 3 (die vier Jahre zuvor veröffentlicht worden war). Zufall oder Plagiat? Wer beeinflußte jetzt wen? Oder waren beide Komponisten einfach Männer ihrer Zeit, die dieselbe lingua musica sprachen? Sicher können wir nicht sein. Die Ähnlichkeiten sind jedoch auffallend. Die Sonate in h-Moll ist tatsächlich außerordentlich: nicht unbedingt eine sonata quasi una fantasia, aber mit viel Phantasie im Charakter. Der erste Satz nach einer langsamen Einleitung ist ausladend, die Expositon (die wiederholt wird) schließt mit der dominanten Molltonart (cf op. 25 Nr. 5) ab, gefolgt von einer anhaltenden Durchführung, die eine zweiteilige legato Kanonspartierung einer brillanten staccato Attacke, frischen Terzen und gebrochenen Bravouroktaven gegenüberstellt. Der zweite Satz, der die Funktionen von abwechselndem Adagio und Finale kombiniert, besitzt eine eigenartige Struktur: A1 (Largo)—B1 (Allegro)—A2 (Molto adagio)—B2 (Presto). A1 ist eine Sonatenform, der Anfang des Durchführungsteils deutet zyklisch rückwärts auf das Paar verminderter Septimen in der rechten Hand, die eine Quart auseinander liegen und die langsame Einleitung des ersten Satzes abrunden. In der Reprise fällt das erste Thema weg, das statt dessen in A2, einer wilden, beschleunigten Koda voll virtuoser Figuration und gravierender Kadenz wiederkehrt. Mit ihrer ominösen, doppelt punktierten Einleitung in der Molltonart ist die Sonate in D-Dur op. 40 Nr. 3 eher konventionell—nämlich eine Sonate im brillante Stil, der sich gleichermaßen an Beethoven wie an Mozart orientiert. Deutlichste Anlehnung an Beethoven ist das lyrische erste Thema des ersten Satzes, eine Idee, deren Kombination aus tonischem Pedalton und verminderter Septsubdominate an die Einleitung von Beethovens „Pastorale“-Sonate, op. 28 (in derselben Tonart) erinnert, die einen Monat zuvor in Wien erschienen war. Anklänge an Mozart hat das dolce Element der zweiten Themengruppe desselben Allegros, ein Thema von kindlicher Einfachheit, das aber auch an Schubert erinnern könnte (beispielsweise das Rondo der Sonate in D-Dur, D850). Am Anfang ist der Tonfall von natürlichem C im ersten Thema harmonisch. Später, in der Polyphonie des Durchführungsteils wird er tonal—interessantes Beispiel für eine organisch langfristige Verbindung. Mit dem langsamen d-Moll-Satz, der unmittelbar das Finale (ein frisches Sonatenrondo mit schwierigem, kanonischem minore) einleitet, wird die Aufmerksamkeit in eine andere Richtung gelenkt: ein sehnsuchtsvolles Gemälde reichhaltiger gran espressione Ausdrücke, gestützt von wunderbaren harmonischen Wohlklängen, Verzierungen und „Stimmlichkeiten“. Treffend trägt die Sonate in der ersten Ausgabe den Titel „Für das Piano Forte“—denn hier ist Musik, die aus einem Instrument entsprang, das schon modern war.